Morph from Scott Lobdell’s and Joe Madureira’s Astonishing X-Men v1, 1995 (“Age of Apocalypse” storyline): no idea why I own a copy of this comic book, which is mediocre at best. But Lobdell and Madureira employ Morph’s shapeshifting abilities for comedic purposes, which makes him the most memorable character here. Bishop from David Hine’s and Yanick Paquette’s Civil War: X-Men, 2007: while I find Bishop’s mutant power (“energy absorption and redirection” – Wikipedia) rather boring and himself as a character not very likeable, his backstory – coming from a dystopian future – makes for interesting storytelling material. 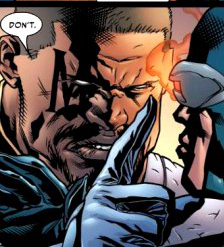 In Civil War: X-Men, Bishop feels compelled to side with the government and turn against Cyclops and the other X-Men. Wolverine from Cullen Bunn’s and Paul Pelletier’s run on Wolverine v4, 2012: while Wolverine certainly isn’t an underexposed character, Bunn and Pelletier showed that his backstory still has some new plot devices in it. Plus, his regenerating abilities can be stunningly visualised, e.g. 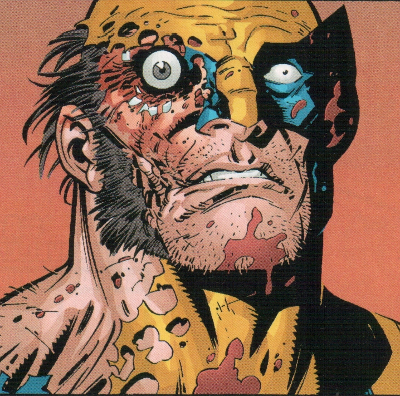 when half his face is blown off by a shotgun, and he regrows his eye during the same fight scene (in #306). 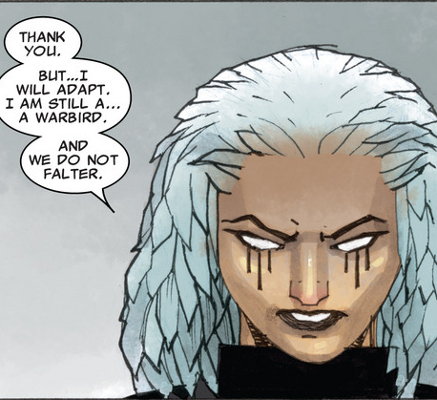 Warbird from Marjorie Liu’s and Gabriel Hernandez Walta’s run on Astonishing X-Men, 2013: Warbird is a member of the Shi’ar alien race and not a mutated human, but her ‘otherness’ (which Liu frequently emphasised) matches that of the other X-Men misfits nicely. 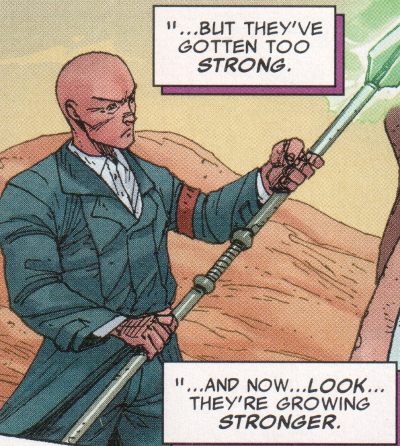 Nazi Xavier from Greg Pak’s and Andre Araujo’s X-Treme X-Men v2, 2013: it’s Charles Xavier, the popular telepath. Only he’s a nazi. X-Treme X-Men introduced many alternate versions of well-known characters from parallel worlds, one weirder than the other. Technically Nazi Xavier is a villain, not an X-Man, but Marvel never had much problems with changing a villain into a hero and vice versa. Such a ‘deal with the devil’ would create those tensions that seem to be all-important in any superhero team. Magneto from Cullen Bunn’s and Gabriel Hernandez Walta’s Magneto, 2014: Magneto has already undergone the treatment from villain to X-Man (and back again, probably several times), so it shouldn’t be a problem to have him on the team too. It would be interesting to have Holocaust survivor Magneto (don’t ask me how old he is supposed to be) on the same team as Nazi Xavier, but the reason I want Magneto on my ideal X-Men team is that it’s just so much fun to see him twisting and twirling pieces of metal around. Three times Nightcrawler by the three best X-Termination artists: Age of Apocalypse Nightcrawler by Gabriel Hernandez Walta, Kurt Waggoner by André Araújo, and Age of Apocalypse Nightcrawler by Matteo Buffagni. It’s not that I’ve never read a crossover story before, but when I did, it was always after it had been collected into trade paperbacks. This allowed me to make a conscious decision to buy the TPBs. However, it’s quite a different thing when a comic book series you’ve subscribed to becomes part of a crossover. Do you really want to purchase additional comic books, from series you don’t care about, by creators you’re not interested in, just to be able to grasp the story in “your” series? In the past, my answer was no – for instance, I dropped Swamp Thing when the “Rotworld” crossover started. This time, though, I decided to play along. I had been reading Astonishing X-Men (AXM) for some time (see my review of #48-51 and my previous blog post on #57) when the crossover event X-Termination was announced, spanning the books AXM, Age of Apocalypse, X-Treme X-Men and an eponymous mini-series. Here’s what I think of each issue. Although not listed as part of X-Termination, the story actually starts in AXM #59. Previously in AXM: after the gay marriage storyline, the book focused on the character Karma and two other, virtually indistinguishable Asian women. I must say I had grown tired of Mike Perkins’s art, when Gabriel Hernandez Walta came to the rescue. 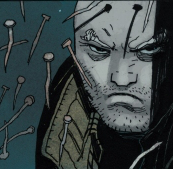 Issue #58 was a filler one-shot, but in #59 we’re heading straight towards X-Termination. 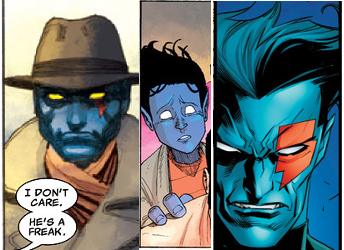 The X-Men are hunting an alternate universe version of Nightcrawler, who apparently has committed murder, off-panel. Not much happens in this issue, but the nice art makes it a worthwhile, atmospheric read. The first official “prologue to X-Termination” is Age of Apocalypse #13. Most of the story here takes place in an alternate reality – the “Age of Apocalypse” – and is (yet) unconnected to the events in AXM. The aim of this issue, it seems, is to recap the previous events in this series, and maybe even to introduce new readers to this post-apocalyptic setting with all its alternate versions of the X-Men. But I don’t find all these little episodes very enlightening. Then again, most of what happens here is of no importance to the crossover story anyway. It would just have been nice to get to know all the obscure characters which do play a role in X-Termination later. What really repels me, though, is the art: I can only guess that Renato Arlem and Lee Loughridge (I’m not sure what Valentine de Landro’s contribution to this book was) wanted to make the artwork suit the dark and grim atmosphere of the setting, but the result looks just murky at best. The second prologue, according to an advertisement flyer, is X-Treme X-Men #12, even though it doesn’t say so anywhere in the issue. In contrast to Age of Apocalype, X-Treme X-Men is a beauty to behold. André Araújo’s style of drawing is more cartoonish, almost manga-esque, yet in combination with the unobtrusive colouring reminiscent of European comics. Greg Pak tells the story of yet another alternate reality X-Men team, who witness the opening of a transdimensional rift and the arrival of the three supervillains of X-Termination. But he tells that story with lots of humour, it seems. Suffice to say that there are three evil versions of Professor Xavier: “Nazi Xavier”, “Witch King Xavier”, and “the Floating Head”. It’s a pity that X-Treme X-Men was cancelled after X-Termination, as this issue makes me want to read more of this series. The first official part of X-Termination is X-Termination #1 (of 2). Meanwhile, another portal is opened from the “real” earth to the Age of Apocalypse, where the three X-Men teams meet, plus a fourth party, the aforementioned villainous trio. The art is the weak point of this book again; I find the way Lopez handles anatomies and facial expressions not very convincing. For the next installment of X-Termination, we return to AXM (#60). What a disappointment: while this issue is written by regular AXM writer Marjorie Liu, the art is not by Gabriel Hernandez Walta. Instead, the first half is drawn by Matteo Buffagni and coloured by Christopher Sotomayor, and the second half is drawn by Renato Arlem and coloured by Lee Loughridge. Buffagni and Sotomayor seem to go for a 90s vibe, with unnervingly bright colours. 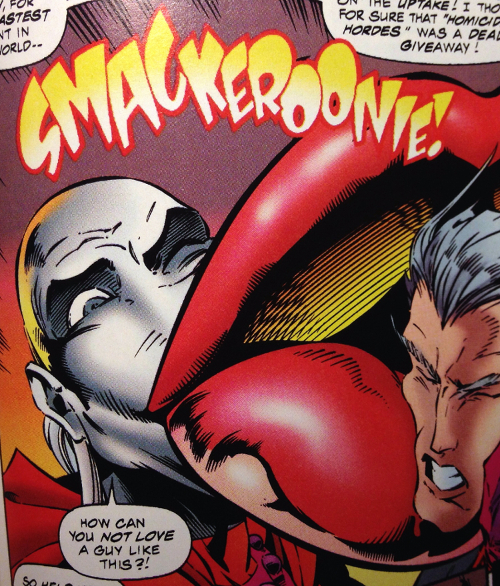 Arlem’s and Loughridge’s art is just as off-putting as in Age of Apocalypse #13. Story-wise, it’s mainly fighty-fighty here. X-Termination continues in Age of Apocalypse #14. Again there are two art teams in this comic book, but this time there is a system to the shifts: there’s beautiful art by André Araújo and Cris Peter in the “real world” scenes, and ugly art by Renato Arlem and Lee Loughridge in the “Age of Apocalypse” scenes. The fighting against the alien villains continues. X-Termination part four is told in X-Treme X-Men #13. More artists are introduced, while the story continues to leave me cold (despite referencing the Dark Phoenix saga). Mogorron’s and Valdes’s respective art styles are simplifying and cartoonish, which isn’t necessarily a bad thing, but here it just looks sloppy. The penultimate X-Termination installment is AXM #61. Visually it gets even more confusing with not only two but three art teams in one issue, none of which I’m particularly fond of. Which is a shame, because the story finally seems to go somewhere, when the alternate universe version of Jean Grey is threatened to be corrupted by the power of the “Apocalypse Seed”. The crossover story concludes in X-Termination #2. Again there are just too many artists, some of which have produced here what might be among the worst art I’ve ever seen in a Marvel comic. The conclusion of the story doesn’t feel very epic, even though the three page epilogue adds a nice touch. Overall, the X-Termination crossover feels like a waste of $ 27.92 and an unwelcome interruption of AXM, which in fact continues with #62 to be a strong series, well written and well drawn (by Hernandez Walta again). The only positive outcome for me was to discover André Araújo‘s art, of which I hope to see more in the future. Still, my personal reservations against crossover events have been confirmed, and I can’t help wondering why such marketing tricks, more often than not, achieve to boost the sales of all tie-in issues. Then again, the commercial success of X-Termination seems to have been moderate – after all, this isn’t exactly Marvel’s big summer event. Erwin Panofsky’s perspective as symbolic form – in comics? In his essay “Perspective as Symbolic Form” (“Die Perspektive als ‘symbolische Form'”, 1927), Erwin Panofsky dispels the myth that artists didn’t know anything about perspectival construction before the Renaissance. He shows that the Ancient Greeks and Romans just employed a different system than the vanishing point system we are used to today, and neither can be said to be more “correct” than the other. For Panofsky, the transition from the old to the new system was a paradigm shift. As long as a perspectival paradigm is upheld, artists will construct their pictures in that system. Once a paradigm shift occurs, there is no turning back to the old system – artists don’t choose between different systems. 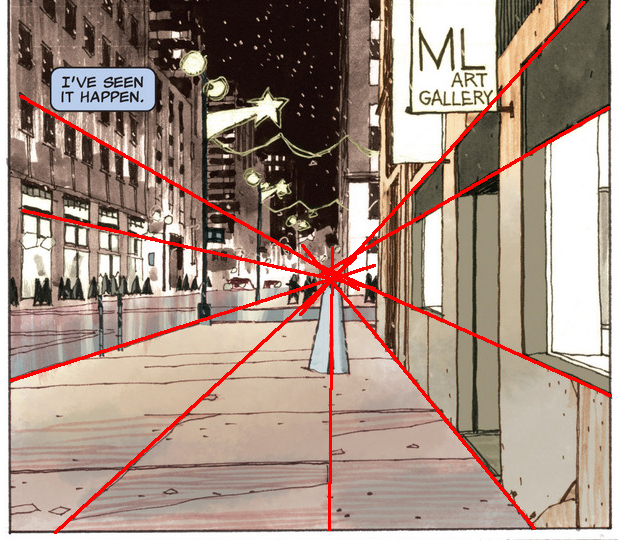 If we trace the lines indicated by rows of windows or sidewalk seams (traced in red by myself here), which would be parallel to each other in real three-dimensional space, they converge in a single vanishing point when Hernandez Walta projects them onto the two-dimensional space of his panel. Furthermore, this vanishing point is at the same location in the picture as the head of the character Warbird, the protagonist of this story. Parallel lines formed by the furniture in the depicted room (assuming the furniture is meant to be rectangular and arranged in parallel) stay parallel in the projection – they never converge even if we extend them beyond the panel borders. 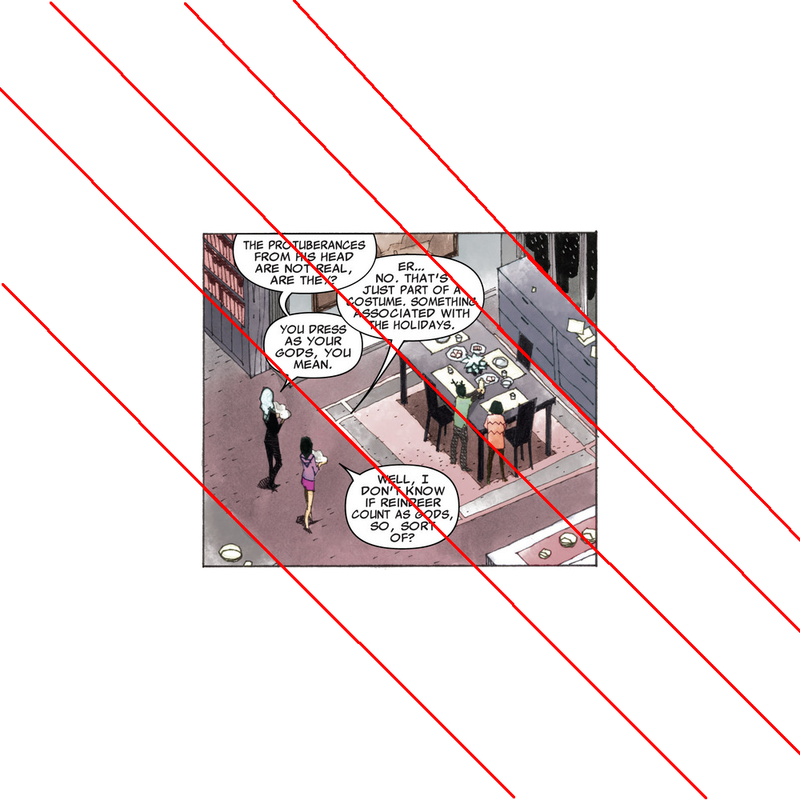 Overall, the predominant perspectival construction system in Astonishing X-Men #57 is still the vanishing point system. But maybe Hernandez Walta’s little isometric deviations are a sign that the vanishing point paradigm isn’t quite as uncontested nowadays as it used to be.